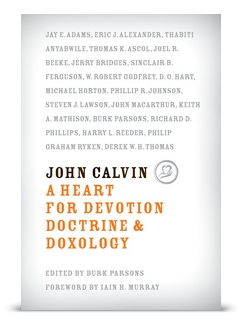 To mark the 504th anniversary of John Calvin’s birth (July 10, 1509), we’re reducing the price of the hardcover edition of John Calvin: A Heart for Devotion, Doctrine, and Doxology to $5.04. This book, originally published to celebrate the 500th anniversary of Calvin’s birth in 2009, is edited by Burk Parsons and has contributions from Jay Adams, Eric Alexander Thabiti Anyabwile, Joel Beeke, Jerry Bridges, Sinclair Ferguson, Robert Godfrey, D. G. Hart, Michael Horton, Phillip R. Johnson, Steven Lawson, John MacArthur, Keith Mathison, Richard Phillips, Harry Reeder, Philip Graham Ryken, Derek Thomas, Thomas Ascol, and others. While supplies last. Sale ends 11:59 PM ET July 10, 2013.